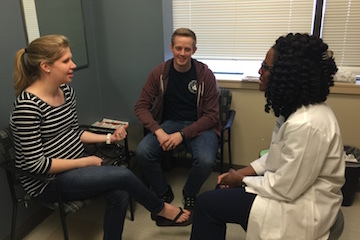 Dr. Tiffany Woodus meets with a patient and her husband in her clinic at UT Southwestern. 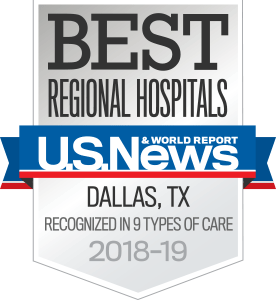 “Can you recommend a good Ob/Gyn?” Not a week goes by without a friend, co-worker, or a new Dallas-Fort Worth resident asking me this question. 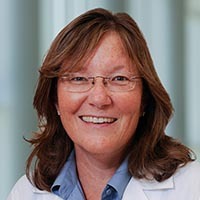 I trained as an obstetrician and have been in practice here for many years, so I know plenty of excellent physicians in the area. Asking for recommendations from friends and family is a good place to start, but remember: Choosing an Ob/Gyn is a personal decision. A good Ob/Gyn for one woman may not be a good fit for another. It’s important to understand what your insurance does and doesn’t cover. Review your benefits and ask questions if you don’t understand any part of the coverage. This is also a good time to make sure you understand what costs you’re responsible for – especially for some genetic testing. Find out which hospitals and providers are considered “in-network,” where you’ll receive care at a lower price. Going out-of-network can be costly. The bills can add up if there’s a complication and you or your baby needs special care, such as a stay in the neonatal intensive care unit (NICU). Generally, I don’t think it’s worthwhile to look out-of-network, especially for pregnancy care and labor and delivery. However, there are exceptions. While I typically recommend staying in-network to avoid paying higher bills, if you have a chronic medical problem, such as diabetes or heart disease or have had previous pregnancy complications, you may need a higher level of care than your in-network provider can give. 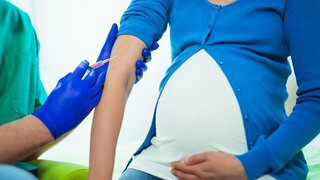 A maternal-fetal medicine practice that provides high-risk obstetric care may be best in these situations. Insurance companies can sometimes be persuaded to authorize care even if the physicians are not in-network. After all, a better outcome for mom and baby should translate to overall decreased costs for the company. I know it’s hard to resist ads that show beautifully staged photos of labor and delivery suites with amenities such as massages and pedicures. But let’s be realistic. 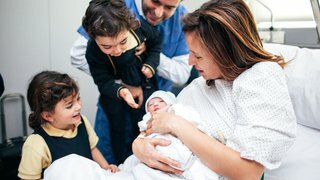 You likely won’t be in the hospital much longer than a couple days if you have a vaginal delivery – and not much longer than that if you have a C-section. What level of NICU care does the hospital provide? What prenatal education classes are offered? 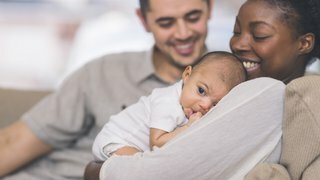 What type of care and lactation support is offered after birth? After you have chosen a hospital, look at the list of physicians who practice there and compare them to doctors who are on your insurance plan. Then, narrow down the list and start digging. I don’t entirely trust online reviews, although I have friends who have used them to select a physician. I prefer a personal approach – ask family, friends, and colleagues who they have used. Also, call practices and ask if their physicians will talk to patients before enrolling them for care. Some women reverse this process; they find a physician and agree to deliver at the hospital where the physician practices regularly. This is fine, but if having your specific doctor present at the delivery is important to you, make sure to find out their call coverage arrangements ahead of time. It’s pretty unusual these days to find an Ob/Gyn who delivers babies for all of their own patients. You’ll likely see your Ob/Gyn through prenatal care and deliver with the doctor on staff when you go into labor. You can’t predict what pregnancy, labor, and delivery will bring. But, you can get an idea of your doctor’s approach to care and how they and the delivery team may respond in certain situations. Finally, go with your gut. Do you feel comfortable with the Ob/Gyn? Sometimes the X factor is something you just can’t quite put your finger on! If, after you’ve chosen an Ob/Gyn, things don’t seem to be working, have a frank discussion with your doctor about your concerns. If you can’t work out your differences, changing physicians may make sense. However, be aware many doctors don’t like to accept new patients in the third trimester. And if you want to deliver at the same hospital, but with a different physician, check the arrangements for night and weekend coverage so you don’t end up in the awkward position of being delivered by the physician you chose not to continue care with. There are many decisions to make during pregnancy, and choosing an Ob/Gyn is one of the most important. Do your homework and don’t settle for the first name you come across. You want confidence you and your baby are in the most capable hands. Learn more about our Ob/Gyn team or call 214-645-8300 if you have questions or want more information about delivering your baby at Clements University Hospital.